Fit bottom pastry into a pie dish. 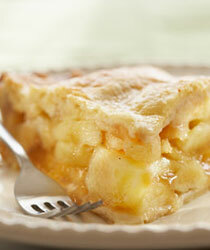 In a large mixing bowl sprinkle lemon juice over apples and stir to mix. Using a cup or small bowl stir together stevia, flour, nutmeg, cinnamon, and cloves or allspice. Sprinkle spice mixture over apples and carefully stir to coat apples. Pile apples into bottom crust. Dot with butter. With water, moisten the outer rim of the lower crust. Place upper crust on pie and crimp edges together. Slit top of pie to allow steam to escape. Place on a cookie sheet. Bake at 350° F in a preheated oven for 55 - 60 minutes. Aluminum foil can be placed over the pie during the last 15 minutes to prevent over-browning. Cool on a rack, cover and leave at room temperature overnight or refrigerate if you like.